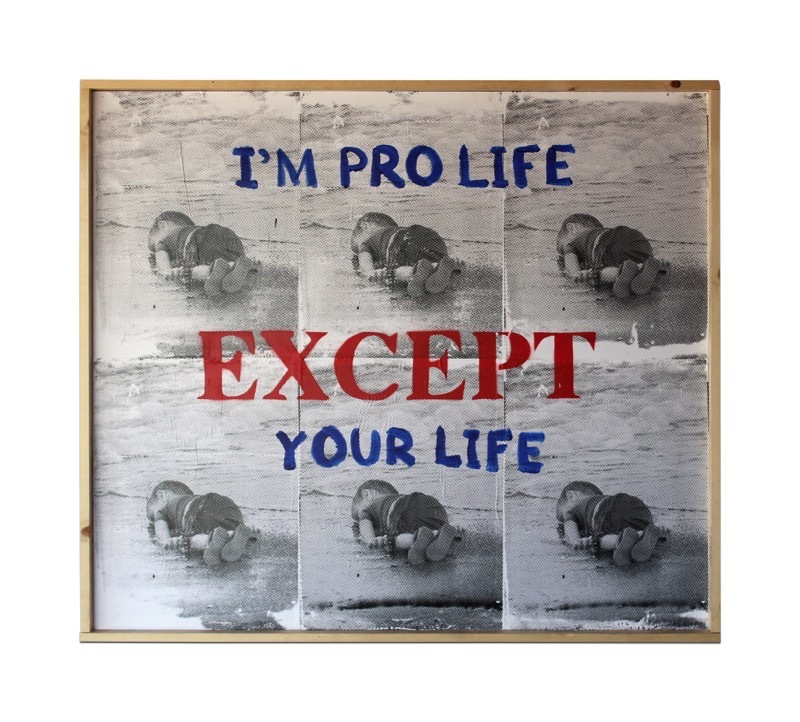 View cart “‘Pro Life’ by Lucas Raynaud (print)” has been added to your cart. MEDIUM: Screen printed halftone images of wounded Syrian child pasted onto wooden box frame and painted with aerosol and acrylic. SIZE/DIMENSIONS: 53.5 x 47 in. Contact art@gallery38.com with any inquiries. Gallery 38 is pleased to present “Excepted” by Lucas Raynaud. In using the word Excepted, the intent is to demonstrate exclusion while verbally sounding like acceptance. The exhibit will feature all new works by Lucas Raynaud, mixed media pieces as well as interactive installations that will highlight the use of religion, politics and changing narratives to strip human beings of rights as well as aide. The artist’s attempt is not to attack people with different views than himself but rather to challenge the audience and really hold up a magnifying glass to their beliefs to see if they still hold up. The exhibit will use flags over light boxes, large screen prints and woodwork installations to pose different questions. Terms such as “All Lives Matter” are used to counter activists and silence their fight, so the artist challenges the term to see if the people that use those statements really believe it. We are in a time in which many of the religions and groups that are based on love and compassion are now the leaders in the fight to oppress. The artist’s goal is to challenge that and to leave the audience with the options to either fight for those in need or stop pretending that you care.